As a solution, businesses may use a device that converts a two-line, single-phase AC source to three-line, three-phase power. The two options that will be explored in this article include phase converter and variable frequency drive (VFD or inverter). A phase converter facilitates three-phase conversion by taking two single-phase lines and supplementing them with an additional leg, resulting in true three-phase power. Phase converters have been around for quite some time and come with an average lifespan of 30 years, when properly maintained. •	Static Phase Converter: Suitable for low-powered motors; cannot balance current on three differing lines. In most cases, the winding that carries the majority of the load is maximized at 50 percent to 80 percent of the nameplate horsepower. Hence, the connected motor does not run at full horsepower. It includes a capacitor (creates the magnetic field) and a voltage sensitive relay (disconnects capacitor when motor is started). •	Rotary Phase Converter: Capable of meeting strict horsepower requirements set by the nameplate of the connected motor, with very minimal power loss. Ideal for large machines with heavy starting loads. Uses an induction motor (idler) for generating the third leg of the three-phase conversion process. As an efficient voltage conversion tool, the units offer up to 95 percent conversion efficiency, with losses typically in the single digits (below 10 percent). •	Digital Phase Converter: This type of phase converter is solid state, and uses a digital signal processor (DSP) to generate third-phase power. Compared to static and rotary phase converters, this unit operates quietly and more accurately. It does not use an idler. The way a VFD facilitates phase conversion differs, compared to phase converters. During installation, the device is wired to the supply line and motor. Compared to a phase converter, controls take place on the VFD interface – not a set of switches or using starters. Common applications include drill presses, large mills and pumps, CNC, cranes, automation and lathes. It’s important to highlight that when sizing a VFD, one must check for the Full-load Amps (FLA) rating on the nameplate, not the horsepower rating. During operation, the unit converts the single-phase AC supply line (input) into DC, which is converted to three-phase AC on the output side. To start, a bridge rectifier (consisting of 4 or 6 semiconductor diodes) is used to facilitate the initial conversion from AC to DC voltage. At this stage, the DC voltage generated is ‘dirty’ or filled with ripples in its waveform. Next, a capacitator bank acts as a filter to smoothen out the DC voltage. 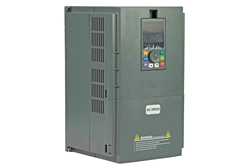 In the next section of the VFD, DC voltage is converted to AC three-phase, via an inverter. Switches in the inverter manages positive and negative voltages that are needed to generate the desired phase and frequency. The wave produced by the VFD on the output side is rectangular, as the units are unable to generate a sinusoidal wave. Both devices can facilitate phase conversion, from single phase to three phase. Choosing one over the other depends on a handful of factors, such as the number of machines connected to the unit, motor power requirements and costs. All of these variables will be addressed in this section of the article. For operators who need to simultaneously run more than one three-phase machine from a single-phase supply line, a phase converter is highly recommended. VFDs are more applicable to running one connected machine at a time, as well as for highly accurate control of starting and stopping connected motors, such as an industrial conveyor belt in a manufacturing plant. As for specific types of phase converters, a static phase converter is suitable for light loads and machines with minimal starting loads. With this in mind, if you’re operating large saws and air compressors at the facility, it would be more advisable to consider a rotary phase converter because the units are more capable of handling large starting loads. Compared to phase converters, which cannot adjust frequency or motor speed, VFDs provide more control over several aspects of power regulation and distribution. Such factors include motor speed, frequency, direction and soft starting (great for preserving the lifespan of large machines and reducing inrush currents). It is worth noting that VFDs can contribute to radio frequency interference, due to the lack of smooth sinusoidal characteristics of the waveform generated. The general drawbacks associated with VFDs can typically be rectified by rewiring the connected machine to make it more compatible with the device. Lastly, individuals who are interested in quick setup and installation may benefit from using phase converters. Electronic VFDs require some programming to meet the requirements of the connected machine and consist of more complicated settings to configure. The units are also more compact than a standard phase converter with an idler. This offers more space-saving advantages for businesses.